Slots Shot is one of Wario's minigames in Super Mario 64 DS. 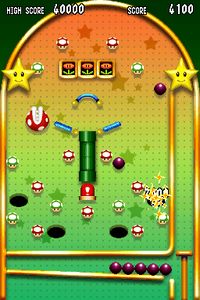 The player begins by launching a ball pinball-style (similar to Bingo Ball). The object of the game is to get the ball in a pipe that will activate a slot machine. First, the player has to shoot the ball into two Piranha Plants to remove barriers that are blocking the pipe. Then, the player can shoot the ball into the pipe. After being awarded 3000 points, the ball hits a switch that activates a small slot machine. Lining up three symbols on the slot machine can win the player up to 10,000 points (depending on the symbol). If the player misses the pipe, the ball bounces on some mushrooms (for 300 points each) and can land in one of four warp holes. Landing in these holes returns the ball to the player and earns 2000 points. Due to the fact that the mushrooms do not disappear (red ones do not disappear at all, while green ones do for a short time), there is no maximum score. The bars swing open when a ball goes in a Piranha Plant. Sink the ball into the pipe to trigger the slots Switch. Get 3 items in a row for a bonus! At the start to launch the ball, the player has to touch the stylus to the flipper and pull back. A ball will roll on and then the player must let go to launch it, the power of the launch (the speed which the flipper is released) determines where the ball will fly. Repeat this eight times for eight balls and the game is over. This game does have a record system. This page was last edited on April 3, 2019, at 08:58.